Check my calendar for making an appointment (약속잡기): JC's Calendar Then, send me an email with an available slot you want to see me. Heterogeneous Defect Prediction (HDP) has been accepted for ESEC/FSE2015! 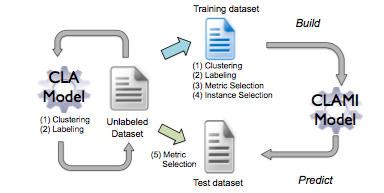 "CLAMI: Defect Prediction on Unlabeled Datasets" has been accepted for ASE2015! I'm JC (Jaechang Nam, 남재창 in Korean, and 南載昌 in Chinese) and wokring as an assistant professor at the CSEE department, Handong Global University, Korea. I'm operating Intelligent Software Engineering Lab (ISEL) with excellent Handong students. Three papers (two short papers and one paper for the UG track) have been accepted for Korea Coference on Software Engineering (KCSE2019). These are the first achievements of ISEL by my undergraduate students. The extended version of an ICSE2016 paper, entitled "Deep Semantic Feature Learning for Software Defect Prediction," has been accepted for IEEE Transactions on Software Engineering (TSE). See complete list of my publications. Research Assistant Professor @Computer Science and Engineering at POSTECH (Pohang University of Science and Technology), Korea, Oct. 2017 ~ Feb. 2018. Postdoctoral Fellow @Electrical and Computer Engineering at University of Waterloo, ON, Canada, Sep. 2015 ~ Sep. 2017. Fellow @International Institute for Software Techinlogy at United Nations University, Macau, Jun. 2012 ~ Aug. 2013. Instructor @Yanbian University of Science and Technology, China, Course: Software Engineering, 2012 Summer. Internship @Software Engineering Chair at Saarland University, Germany, Jun. 2010 ~ Aug. 2010. Freelance Software Engineer, Korea, Oct. 2005 ~ Jun. 2007. Program Development Officer (First lieutenant) @The 2nd Logistics Support Command in R.O.K. Army, Oct. 2003 ~ Jun. 2005. Head of Computer Center (Second lieutenant) @The 16th Supply Battalion in R.O.K. Army, Sep. 2002 ~ Sep. 2003. Research Assistant @GIS institute at Handong Global University, Korea, Jun. 1999 ~ Dec. 2001. Software Defect Prediction: Trends and Challenges, MSR Asia Summit, Tokyo, Japan, March 2017. Lifove Bible (Multi-language Bible Viewer for Android), 2010. NLTC Evaluation System (Education Information System), 2006. Article Archive(Cache) Sever (for PUST), 2006. Army Vehicle Insurance Management System (Confidential), 2004. Operation Map Information System (Web(SVG)-based Map Application for The 2nd Logistics Support Command, Secret), 2003. EDWGIS (Environmental Data Web GIS System, not available), 2001. Cyber Image Information System for KICT (Web-based Satellite Image Trading Market, prototype), 2001. GIS815 Cyber Research Community (Web-based Research Community, not available), 1999. Korean Blog (Tistory) for graduate students.